Berger is committed to helping horticultural producers improve production and performance by offering our products in convenient, environmentally-friendly packaging. Below, discover all the advantages of one of our package formats! Berger was the first to introduce the Skyscraper format in 1993, a revolution in the industry. The Skyscraper reduces handling labor and decreases packaging waste by nearly 80%. Only 70 lbs of plastics are used per load (24 pallets) as compared to 350 lbs of plastic for 3.8 ft³ of bags. It takes 2.5 frewer hours in manual labor per skyscraper and It allows a fast unloading; 30 to 45 minutes per load with one person and one forklift. You can store your Skyscrapers outside (40 x 48 x 98 po), regardless of weather conditions. Moreover, it remains entirely intact during unwrapping for a clean workspace. Interested in Berger’s Skyscraper but don’t own the equipment to use it? 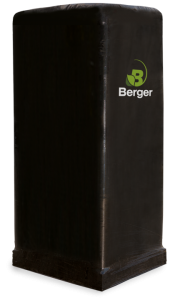 Berger offers a bale breaker equipment program to help you to get the most out of your Skyscraper. Contact your sales representative or our customer service to learn more about our Skyscraper equipment!